With headquarters in Malaysia, Hide.Me is a VPN provider that offers a highly effective solution to protect your connection from security threats. Hide.Me is gaining recognition as a reliable option to defend your online privacy, thanks to its solid no logs policy. The service also gives you flexibility to access content from around the world, even if it is subject to geographical restrictions. They have a convenient free option that lets you disguise your IP address and location but to get stronger security and more features, the best choice is to upgrade to their Premium service. We’ll take a look at Hide.Me to find out how it protects your privacy and enables you to enjoy online freedom. One of the reasons why many users consider Hide.Me in the first place is the fact that the provider supports a large selection of protocols. 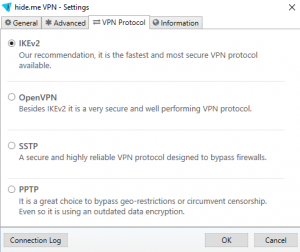 Apart from OpenVPN, L2TP and PPTP, which are the most common options, Hide.Me offers SSTP, IKEv1, IKEv2 and SoftEther. The latter is a technology released in 2014 and it is becoming very popular thanks to its versatility, flexibility and impressive speed. For OpenVPN and IKEv2, Hide.Me uses AES 256-bit encryption, a high standard that is set to keep your data secure. In addition, they offer SOCKS, a proxy solution that can handle any type of internet traffic, giving you greater flexibility for accessing content. Apart from its great variety of protocols and the fact that SoftEther is supported, Hide.Me stands out for being one of the few providers that offer port forwarding. This is a solution that enhances security and it can be set up without major complications. 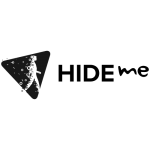 On top of providing versatility on connection protocols, Hide.me also hosts and provides their own DNS servers, adding an additional layer of security and privacy. The high level of security and the extensive list of options supported, will allow you to enjoy a versatile online experience. Privacy protection is an area in which Hide.Me gets top marks. They offer a no logs policy that promises that no usage or online activity is recorded. Furthermore, the provider received a certification from security specialist Leon Juranic, CEO of Defense Code, confirming that Hide.Me is a log-free solution. After an audit was carried, Juranic was able to establish that Hide.Me is true to its promise of not keeping logs and even free users can benefit from this protection to privacy because they are not subject to data transfer logs. The company also mentions that if a request is received from authorities, it will respond but since there are no logs kept, there is no information that it can provide and the privacy of its customers won’t be compromised at any stage. In order to register, you are only asked to provide an email address, which could be a spare or anonymous one. Additionally, the fact that they are based in Malaysia means that they are not subject to the control and monitoring that affects US and EU companies. Bitcoin is accepted as method of payment, which confirms Hide.Me’s commitment to privacy and anonymity. Hide.Me offers guides that will allow you to set up the service on a variety of platforms. These guides will also help you to configure the protocol of your choice in your operating system. They offer dedicated software for Windows, Android, iOS and Mac. It is also possible to set up the service manually on routers, Blackberry and other platforms. The custom clients are easy to use and include advanced features such IP leak protection, Kill Switch and DNS leak protection. If a connection initially fails, an option called “fallback protocol” will automatically reconfigure your settings to solve the problem. Port forwarding is available for Premium customers. As previously mentioned, there is a convenient free web proxy available on their website. This allows you to access websites that are not available in your country, while keeping your actual location private. There are three locations to choose from: United States, Germany and Netherlands. If you need to bypass blocks and get fast access to a website, this is a practical; solution. Hide.Me currently has servers in nearly 30 countries including Australia, Mexico, Brazil, Netherlands, Canada, Iceland, Romania, Hong Kong, United States, United Kingdom and Morocco. Hide.Me has full control over its servers and the speeds are great, not only for browsing but also for streaming, downloading or playing online games. In addition, ts network is designed to meet top standards of privacy and security. You can use BitTorrent clients with their VPN and if you enable dynamic port-forwarding and use SOCK proxy, you will be able to enjoy the best speeds. You can discover Hide.Me’s service by creating an account without even having to provide financial details. 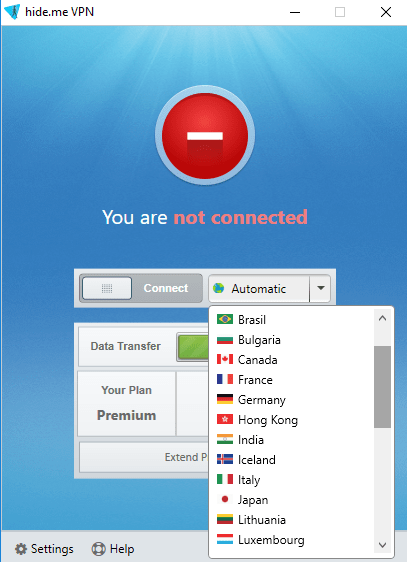 Their free plan can be renewed every 30 days and it allows you to connect to servers in 3 locations: Canada, Netherlands and Singapore. This plan comes with a data transfer limit of 2GB, doesn’t support OpenVPN and you can only connect one device at the time. In spite of the limitations, the free plan is a good way to get started but if you want to enjoy a more versatile experience, it is advisable to upgrade to the Premium or Plus plans. The Plus plan costs $9.95 per month but if you pay for 12 months in advance, the cost is $59.95, meaning that the monthly price is reduced to just $4.99. You get access to all the locations supported, although there is a data transfer limit of 75GB and only one simultaneous connection is allowed. To enjoy unlimited data transfer, support for up to five simultaneous connections, as well as port-forwarding, you can consider the Premium plan. It starts from $19.95 per month but you can enjoy great savings if you pay for $119.95 for a full year since the monthly price is reduced to $9.99. Considering the high quality and security of the service, the prices are reasonable, particularly when you opt for a yearly plan. Paid plans are covered with a 14-day money back guarantee and you can pay using your card, PayPal or Bitcoin. Hide.Me offers helpful set up guides that will take you through every step of the process. They are easy to follow and you can find instructions for different operating systems. The Support area includes a Community forum, FAQ section and details about important aspects of Hide.Me. There is a Support ticket available 24/7 and also a live chat. We were pleased to see the inclusion of the live chat option and when we contacted them, we received a prompt, professional and friendly response. If you are looking for a high level of privacy and an effective service to bypass restrictions, Hide.Me is a fantastic choice. The variety of protocols available and the good speeds supported are some of the best points about the service. Millions of customers already trust Hide.Me and the fact that security experts have confirmed that it is a log-free provider, will get the attention from even more internet users who want to protect their privacy.